These two states are deeply and universally desired by all of humankind, and yet for so many people, they are elusive and transitory. 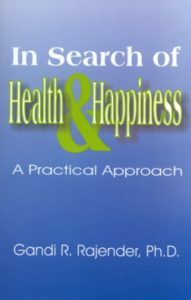 In this book, the author outlines a detailed system for reaching Health and happiness through bodily, mental and spiritual care. After undergoing heart by-pass surgery for blocked arteries, he set out on a quest to improve his own health, and realized that while there is some helpful written information on the subject, much of it is confusing, contradictory and incomplete. There is also an over-emphasis in our culture on appearance, rather than underlying well-being. After careful research and personal experience of various methods, Dr. Rajender has developed a complete program for achieving Health and Happiness. His book covers an entire lifetime of study and experience, and provides a wealth of information about all the elements of a healthful and happy lifestyle for body, mind and spirit. Topics including nutrition, vitamins, exercise and relaxation are discussed in straightforward terms. Moreover, every activity recommended in the book is easy for the reader to put into practice in his or her daily life. In addition, various religious and philosophical approaches to happiness are treated in a fascinating and enlightening manner, while the chapter on “Conscious Living” expresses the author’s belief that fulfillment in life can only be attained while living in the present moment, intensely, with total awareness and concentration. Conscious Living, if practiced consistently, will help people to be more creative, efficient, and productive, and will increase the intensity of their senses, improve their memory, communication and decision-making skills, and lead them closer to their natural goals of Health and Happiness. The book enables the individual to use the full measure of his or her capacities and potentials in the pursuit of increasing levels of happiness.